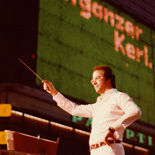 2009 – A magical number for me, marking the 40-year anniversary of my career on the stage and as a conductor, starting as the répétiteur and kapellmeister at the Deutsche Oper Berlin in 1969 and then moving to the Vienna State Opera and Volksoper. I have now spent almost 23 years as the head of musicals in Vienna, acting as the director of music for the Vereinigte Bühnen Wien, and was the first standing guest and since 1980 the honorary conductor of the Czech State Philharmonic Orchestra Brno. This is my chance to rethink my life and make changes, to put my various experiences to use to create something new, to make a new start. 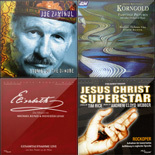 To encourage young musicians, composers, singers and so on. I will resign from my position as the director of music at the Vereinigte Bühnen Wien in the summer of 2010 and will take on new tasks, perhaps as the art director of a medium-sized theatre with all the broad possibilities it would offer for developing an ensemble. Or as the art director of an eclectic, cosmopolitan music festival. Or as a teacher for young conductors, orchestra musicians, composers and singers. My teaching skills are just as widely esteemed as my skills in programme planning and presenting. I look forward to my new challenges and tasks with great anticipation. Caspar Richter. All rights reserved.